Gaudioso has written other memorable contemporary screenplays including, Benvenuti al sud, È nata una star and more recently, Carlo Verdone’s new film, L’abbiamo fatta grossa. Now, he is in the director’s chair for the highly anticipated, Un paese quasi perfetto, which boasts an all-star cast with Silvio Orlando, Fabio Volo (also a famed author), Carlo Buccirosso and Miriam Leone. 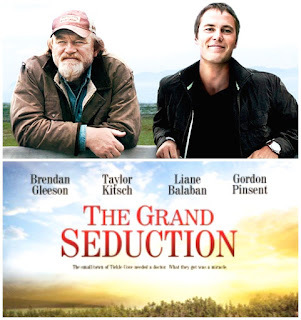 Adapted from Jean-François Pouliot’s 2003 Quebec-made comedy, La grande séduction which was set in a small Canadian harbor, Un paese quasi perfetto takes place in the visually-stunning town of Castelmezzano nestled in the Dolomite mountains of Basilicata. The plot in Gaudioso’s film is the same as the original, only the setting has changed. Un paese quasi perfetto is the story of nearly desperate, but enthusiastic people in dire need of jobs. Most depend on measly government checks to get by. Provoked by the determination of one fed-up inhabitant named Domenico, the town works together to convince the CEO of a factory to build a plant in the town. The biggest requirement is the town must have a residing doctor. And so begins the great adventure to find and convince their chosen big-city Milanese plastic surgeon to pack his bags and set up shop in Castelmezzano. Through briberies, the town beauty and phone tapping, everyone pitches in to help realize their dream of getting back to work. I had the great pleasure of talking (through email) with Massimo Gaudioso. He was generous with his answers to my questions and wrote with passion and love about his work. It’s no surprise that he has had so much success. Our interview was done in Italian, so both versions are included. Why did you want to remake the Canadian film, La grande séduction by Jean-Francois Pouliot? It’s been a while now that I wanted to get back to directing. I am always busy working on other people's projects, I could not find the time to think about one of my own. When they brought me this film I said, here’s a story I would like to have written. In fact, I found several similarities with my style and my personal taste- alternating between comedy and drama- that mix of sentiment and irony, of fantasy and reality. Secondly, the characters, which are very much like those that I’ve always been drawn to: the losers, the poor bastards who bend over backwards to try to stand up to the injustices of life and so daring chase a dream, which ends up being bigger than themselves. Finally the theme- the dignity of work, which I think is very timely in my country. Perché volevi rifare il film canadese, La grande séduction by Jean-Francois Pouliot? Era da un po' di tempo che avevo voglia tornare alla regia ma, essendo sempre impegnato a lavorare sui progetti altrui, non riuscivo a trovare il tempo per pensarne uno tutto mio. Quando mi hanno fatto vedere questo film mi son detto: ecco una storia che mi piacerebbe avere scritto. Infatti avevo trovato diverse affinità con il mio stile e il mio gusto personale. Innanzitutto quella alternanza di comicità e dramma, quel mix di sentimento e ironia, di favola e realtà che lo caratterizzano. In secondo luogo i personaggi, che assomigliano molto a quelli che prediligo da sempre: i perdenti, i poveri cristi che si fanno in quattro per cercare di reagire alle ingiustizie della vita e in modo rocambolesco inseguono un sogno apparentemente troppo più grande di loro. Infine il tema, la dignità del lavoro, che mi sembra di grande attualità nel mio paese, anche se, trattandosi di un tema drammatico, non incontra i favori del pubblico italiano. How did it feel to be the director again after writing for so many years? Actually, I started doing both. Then, out of laziness and the circumstances of life, I found myself just writing. But I have always been an atypical writer, always very aware of what I consider the two elements of screenwriting: the set and the editing. I really enjoyed directing again. I would say it was liberating to get back behind the camera. Come si sente ad essere regista dopo avere scritto le sceneggiature per tanti anni? In realtà io ho cominciato facendo entrambe le cose, poi, un po' per pigrizia, un po' per le circostanze della vita, mi sono trovato a fare soprattutto lo sceneggiatore. Ma sono sempre stato uno sceneggiatore atipico, dal mio punto di vista, sempre molto consapevole di quelli che considero gli altri due momenti della scrittura: il set e il montaggio. Mi sono molto divertito, anzi oserei dire che è stato liberatorio tornare dietro la macchina da presa. How does your experience as a writer influence your work as a director and vice versa? For me, the two have always been inseparable, so I cannot say how one thing affects the other. Perhaps I could say that being a writer gives me more control and even a greater respect for the script, while being a director helps me to be a bit less rigid and abstract in the writing phase, with greater attention to characters. In che modo la tua esperienza come scrittore ha influenzato il tuo lavoro di regista e viceversa? Per me sono sempre state due cose inscindibili, quindi non saprei dire quanto è in che modo una cosa influenza l'altra. Forse potrei dire che l'essere sceneggiatore mi porta ad avere un maggiore controllo e anche un maggiore rispetto del copione, mentre l'essere regista mi aiuta ad essere un po' meno rigido e astratto in fase di scrittura, con una maggiore attenzione verso i personaggi. Why did you choose Castelmezzano as the place for a story adapted from this film? I was looking for a place that had all the right characteristics to be believably adapted from the original. Those characteristics being a very small, isolated town, almost uninhabited for lack of work, but with glimpses of amazing beauty. After a long process of location-hunting, I decided not to go with the sea, which for us is synonymous with holidays. Instead, I focused on the mountains. I thought of the pristine, tourist mountains. Being native to the South, I focused on a southern region that has always been unjustly forgotten and which has unfortunately had problems similar to those told in the film. As soon as I discovered the Dolomite mountains in Basilicata, I had no more doubts. Perché hai scelto Castelmezzano come il luogo ideale per una storia tratta da un film francese? 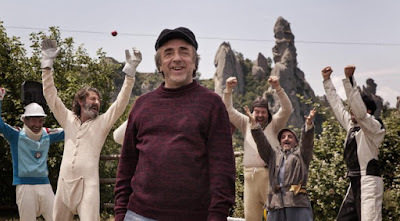 Silvio Orlando in a scene from "Un paese quasi perfetto"
There has been a huge increase in film production in Basilicata in the last few years. Tell me about your experience working there. For me as well as the whole cast and crew, it was a wonderful, human experience. The enthusiasm and the willingness with which we were welcomed is indescribable. I remember that after the last take, we all broke into tears: something that had never happened before, and that I will always carry with me. We involved the entire town and mobilized the entire province. Many locals came to the auditions, people who had never acted nor had ever seen a production with a film camera. I chose many of them as extras because their stories, their faces and their childlike enthusiasm filled the film. I even gave a role to the oldest person in the town, Aunt Catherine at 102-years-old. What a force of nature! There was always a wonderful atmosphere on the set. The sound was crystal-clear due to the air purity and even the light was perfect. What can I say: I hope that the movie projects at least one tenth of these good vibrations. Negli ultimi anni, è stato un aumento della produzione di film in Basilicata. Raccontami la tua esperienza di lavorare lì. È stata per me è per tutta la troupe, attori inclusi, un'esperienza meravigliosa umanamente. L'entusiasmo e la disponibilità con cui siamo stati accolti è indescrivibile. Ricordo che dopo l'ultimo ciak sono scoppiati tutti a piangere: una cosa che non mi era mai capitata e che porterò sempre con me. Abbiamo coinvolto tutto il paese, anzi mobilitato un'intera provincia. Sono venute tantissime persone ai provini, gente che non aveva mai recitato nè aveva la minima idea di cosa fosse la macchina produttiva di un film. Ne ho scelti tanti, anche per fare ruoli minori. Con le loro storie, le loro facce, il loro infantile entusiasmo hanno riempito il film. Ho fatto recitare perfino la più anziana del paese, zia Caterina, 102 anni, una forza della natura! C'è sempre stato un clima splendido sul set, il suono era cristallino per la purezza dell'aria e anche la luce era ideale. Che dire: spero che nel film si senta almeno un decimo di queste buone vibrazioni. Have you thought about your next project? Will you continue with directing? I would like to but then work always has other ideas! Let’s see if I can find the right story.. but there is no hurry. Hai pensato al tuo prossimo progetto? Continuerai con regia? Mi piacerebbe ma lavoro sempre per gli altri! Vediamo se trovo la storia giusta... Senza fretta. Gaudioso's film, Un paese quasi perfetto will actually make its world premiere in the United States on Sunday 21 February at the annual Los Angeles – Italia Festival. 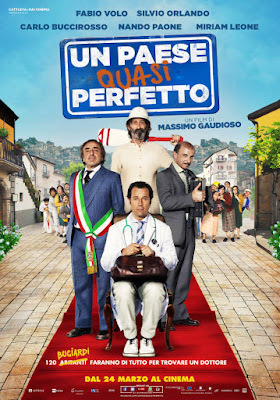 Un paese quasi perfetto will premiere in Italy on 24 March. Watch the trailer. For more information about Castelmezzano and the Dolomite Lucane, visit them online. City council member Michelangelo Soldo, suggests checking out this website - http://www.borghipiubelliditalia.it/en/ - which has information also in English about what he calls "one of the most beautiful villages in Italy". Just type "Castelmezzano" in the search box at the top of the page.